I have two mason jars. I painted them both because that's the super trendy thing to do these days. Inside one jar I keep a stash of cash and in the other I keep the ashes from my first pet, Whiskers, because he looks way cuter on my night stand in a mason jar than boxed up on a shelf in my closet. Okay, I don't really have those jars, but go along with the story anyway... you know, for the sake of this post. 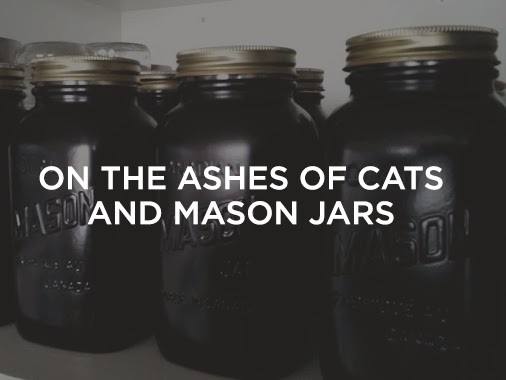 You can't see into either of these jars, because they are super pinterest-y and painted, but like I said, one has a ton of cash and the other has a dead cat. If I offered you the two jars, which would you take? If you are logical, you'll pick the jar with cash in it. If you are illogical, you're probably not going to follow this blog very well. The jars themselves are the exact same. They really have no value. They are just mason jars. The only thing that makes one different from the other is what contents are held within. Take out the contents and they are just jars. They are worth about twenty five cents at the thrift store, a dollar if you grabbed them out of the "vintage section." Put a wad of cash in one, and obviously that jar has a little bit more value. The jar with the cash in it worth more than the figurate cat that nobody cared about but me. I'd be willing to bet all the cash in the first jar, that if I died, that jar with good, ole' Whiskers, would get tossed out pretty quickly. Nobody really cares about Whiskers but me- and I don't even really care about him, I just didn't have the heart to do something with him after he choked on his figurative hair ball. You're just a jar. By yourself, you don't really have all that much value. You can live a whole lifetime doing absolutely nothing... and you'll die, and you won't be able to do anything anymore... because you're just a jar. You can live a whole lifetime doing a million different things... and you'll die, and you won't be able to do anything anymore... because you're just a jar. You and I are like jars. We really don't hold much value in and of ourselves. You can argue that, I don't mind. But at least consider what I'm going to put out there. You're a body. You're flesh and bone. Your time here on Earth is pretty ridiculously short in comparison to all of eternity. Sure, you'll do stuff, you'll make things, you'll have a family, you may even change the world, but by all means, you're just a jar that one day is going to go into the ground or will be scattered across it. And once you're gone, well, you're not going to be doing much work here anymore. You'll breathe your last and that's that. You're just a jar. By yourself, you don't really have all that much value... especially in the scope of time. On your own, without the assistance of ansestry.com or your mom, how many generations back can you identify? Your kids will probably be able to identify less... and one day, chances are you'll be that last generation someone in your lineage will remember. After that... forgotten. This is sounding pretty depressing. But, here's some good news! You're a jar! Shouts of elation! Wait, why are we excited about being a vessel that has little value? Because you're a jar! You can hold stuff in you! And really, what you let in is what gives you your value. You're just a jar. Your value though, that comes from something else all together. Your value is not of you. We're all defined by something. We all find our identity and value in something. You can find your identity in how much people recognize you, or your job, or your family, or how money you have, or how many likes you get on instagram, how quickly someone texts you back, or how often people think of you, and even in how you stack up next to other people. You find your identity in something. What makes you lose your cool and lash out? What makes you happy? What frustrates you? What offends you? Ultimately, what controls you? What is that "one thing" you need to be whole, to be complete, to be content? There's where you find your identity. That's where you find your value. That "one thing" is what you're filling your jar with. It's what gives you your value. Initially, this was at the end of my blog, but I've since moved it up for the sake of being honest about myself before losing readers before they got to the end. Now, here's some bad news. Most often, that "one thing" isn't going to matter once you die. Your job, once you're gone, it's not going to bring you any security. Your money, once you're gone, it's not going to bring you comfort. Even your family, once you're gone, you're not going to gain much satisfaction from them. But there's good news. You are valuable- because an incredibly high price was paid to place value in your life. If you choose to find your identity in the truth that Jesus died for your sake that you would have life forever and have life to the fullest, you'll find value that this world cannot take away. Think about it. If you allow yourself to be wholly defined by the unmerited gift of eternity with the God of the Universe, everything changes. The loss of your job is just the loss of a job, it's not the loss of who you are. The unexpected totaling of your car is just the loss of a piece of metal, it's not the end of your world. They lack of attention from others is just the lack of attention from others, it's not the lack of attention from a God who loves and cares for you. The things that go wrong in your family become things that you can have the faith to believe God can restore and work through, it's not a waste of everything you've worked so hard for. It's a chance for you to see God work more. And when you die, that life in Christ you allowed to give you your identity and value will usher you into the Kingdom of Heaven where crowns will have been laid up for you as you walked in this life working to build that treasure in you. You and I aren't much to look at. Especially in comparison to Jesus. But it is a gracious thing that our lives may be looked upon and all the righteousness, and goodness, and pureness, of Him would be seen. Instead of a dusty old jar, we become so much more. We become heirs to a great kingdom, the sons and daughters to the King. If we choose to live believing that Christ died for us and for us to spend an eternity with him, then we can live looking forward to the life he's given us in eternity with him. And though this may not make much sense, I think that's what's so great about it. How can we, who are nothing, gain everything? Because it's been offered to us. We just have to decide to receive it, to take up the gift, to walk in the light and truth of it. "But we have this treasure in earthen vessels, that the excellence of the power may be of God and not of us. We are hard-pressed on every side, yet not crushed; we are perplexed, but not in despair; persecuted, but not forsaken; struck down, but not destroyed— always carrying about in the body the dying of the Lord Jesus, that the life of Jesus also may be manifested in our body." But it's hard to trust something when you can't see it. When you're a jar and you can't see within, it's hard to know for sure what's inside and live your whole life believing it. But that's what faith is all about. If you could see, you wouldn't need the faith to believe or trust. So even though it's hard, and yeah, life is hard, for everyone, everything you endure as a jar is just momentary. As you endure, and continue on in the faith your inner person is becoming more and more beautiful and your character starts to look more and more like Christ, for it is Him in you, working to make you like Him. "...Even though our outward man is perishing, yet the inward man is being renewed day by day. For our light affliction, which is but for a moment, is working for us a far more exceedingand eternal weight of glory, while we do not look at the things which are seen, but at the things which are not seen. For the things which are seen are temporary, but the things which are not seen are eternal." If the gospel is what you hold within, you have more value than a million jars with all the treasure in the world. The value is not in the vessel, but what the vessel holds. Your value is not in yourself, but in what you allow to be what defines you. Text me if you finish this and I'll bake you cookies or something... and send them in a jar... but not the same jar as Whiskers.